Each year, Wilson Farm chooses schools from the greater Lexington area to participate in its Shop at Wilson Farm Day fundraising event. Schools are chosen based on proximity to Wilson Farm, number of students, and other factors. Once chosen, schools are contacted and a date is provided for that school's "Shop at Wilson Farm Day". Each school or organization gets one "Shop at Wilson Farm Day". Supporters are invited to shop in our Lexington Come to farm stand on that day during our regular business hours. Wilson Farm will provide a customized flyer for each organization that can be distributed to its supporters. When the flyer is presented at checkout, we'll keep track of the sales and donate 20% of the pre-tax subtotal to that school or organization. Almost anything in store counts: Produce, baked goods, prepared foods, items from our garden shop, meats, seafood and much more. The only items that are not eligible are CSA shares, gift cards, case orders and/or other bulk or custom orders. WHERE DO YOU GET A FLYER? If you need the logo in a different size, please let us know! If it snows, don't worry! We'll set up an alternate date. Shortly after your Shop at Wilson Farm Day, we’ll personally deliver a check to your school. Your school principal will decide how the funds will be used. 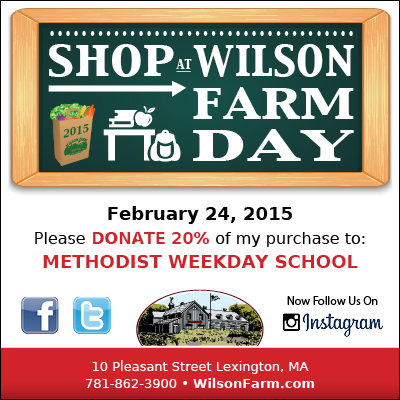 In the past, schools have used their Shop at Wilson Farm Day earnings to purchase projectors, books, scholarship programs, and even lecture series. CAN I SHARE FLYERS WITH OTHERS? Absolutely! Feel free to share your flyer with friends, neighbors, and other members of the community. We do, however, ask that you don’t distribute your flyers here at Wilson Farm. Five generations of the Wilson family grew up in the Lexington area, attended local schools and continue to live and work in the area. We're committed to supporting local schools, and wish you every success during this year's fundraiser! If you have any questions or would like information about the 2014 Shop at Wilson Farm Day program, feel free to contact us by phone at 781-862-3900, or send us an email.